Clarks Original Shoes Uk 7 Clarks F Fit Suede Desert Shoes. Condition is Used. Dispatched with Royal Mail 1st Class. Used but in a good condition with plenty of life left in them. Some rain drop marks but I’m sure these would come off. Ask if any questions and check out my other items. MENS CLARKS Collection Blue Suede /leather Shoes Size 9G .... Condition is Used. Dispatched with Royal Mail 2nd Class. mens clarks originals wallabee size 7 Leaf. I am listing these as used but they come with box as they have only been worn once but were too small.. They are great condition as you would expect with one wear! It was difficult to get the exact colour with the lighting so I have included a picture from Clark’s website showing the true bright vibrant green “leaf” colour so please view the Clarks picture (no.12) for a true depiction. It’s a regrettable sale just need a half size up. Dispatched with Royal Mail 2nd Class signed for. 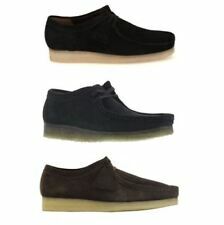 CLARKS ORIGINALS DESERT LONDON. CHOC SUEDE GOES GREAT WITH LIGHT OR DARK DENIM. GOOD USED CON. Men's Clarks Trigenic Size 7 Navy Suede Excellent Condition Dispatched with Royal Mail 2nd Class. Men’s Clarks Original Wallabees Shoes- UK Size 9. Colour : Sand? With a tan leather band round top of shoe. Condition : Great. Only worn a few times, plenty of life left on crepe soul as you can see in pictures. Originally purchased from Oi Polloi in Manchester for £120. U.K postage only!!! CLARKS DESERT LONDON IN COLA SUEDE BNIB UK10 EU 44.5. UNWORN, ALREADY HAVE A PAIR, THESE WERE UNWANTED GIFT. Clarks Wallabees 10 Olive Suede . Condition is Used. Dispatched with Royal Mail 2nd Class. Mens Clarks Originals Desert Shoes, Dark Brown, Suede, Size 10. 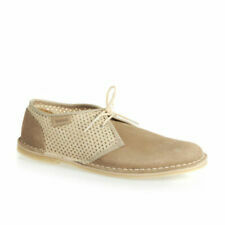 These are the classic Clarks Originals desert shoes, size 10. They are dark brown suede. These shoes are pre-owned but are in good condition. There are some slight dark marks at the front of one shoe but these shoes still look very smart and have lots of wear left in them. Please see photos for condition. If you have any questions, please feel free to message me. Refunds are not accepted. Items will be dispatched within 2 days of payment but I usually dispatch within 24 hours. I am happy to combine postage where possible. Happy bidding!! Clarks Originals Desert Trek Shoes in Brown suede - crepe gum sole. Condition is New with box. Dispatched with Royal Mail 1st Class. 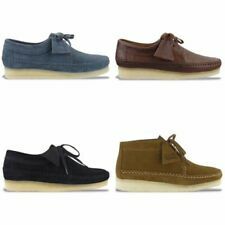 Clarks Wallabees. Black Suede. With loads of life left in them. We have for sale a pair of. Pics do not do them any justice. Brilliant condition, worn a handful of times. Very smart. SIZE 7 / EU 41. Clarks Originals Wallabees Mens Shoes Beige Cord Look Size 8 UK. Here for sale a pair of men’s Clark’s original Wallabees shoes. Size 8 UK. Corded suede uppers. Good condition. Many thanks. STYLE DESERT VULC LO BLACK SUEDE. UPPER SUEDE. SIZE UK 7 / EU 41. COLOUR BLACK. Clarks embossed at rear of each shoe. Clarks England 1825 embossed into each sole. Brown suede. 4 eyelet lace up. SIZE - UK,10 F. 100% AUTHENTIC. CONDITION - VERY GOOD,NO WEAR OR TEAR.CLEAN. MARKS ON SOLES ONLY. Great colour combination. Lush Suede uppers and tough rubber soles. Made by Clarkes. Clarks Summer Suede Loafer Shoes size 11 mens in Blue. These are lovely lace up loafers. Purchased but never worn and have sat in a wardrobe since last summer. Having a clear out so grab a bargain. Any questions please feel free to email. Will send secure and tracked. Please check my feedback and buy with confidence. Thanks for looking. Clarkes suede shoes size 7 in good condition. Clarks Wallabees 10 Grey Worn Once!! Clarks Wallabees 10 Grey. Condition is Used, worn once before realising they are just a little too big for me. Dispatched with Royal Mail 2nd Class. clarks mens shoes size 11 used but hardly worn. clarks mens shoes size 11 hardly worn. . Condition is Used. Dispatched with Royal Mail 2nd Class. 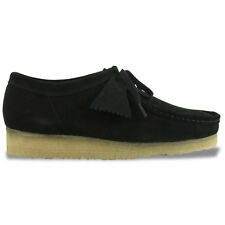 FANTASTIC MENS CLARKS BLACK SUEDE LEATHER CLARKS ORIGINALS LACE UP SHOES SIZE 9, WORN ONCE, RRP £79.00. IN EXCELLENT UNWORN CONDITION. Clarks Deck Shoes Size 10. Clarks Mens Suede Shoes UK Size 9 Low Deserts BRAND NEW. Dispatched with Royal Mail 2nd Class. 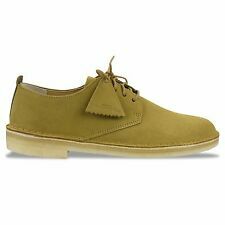 Brand new pair of CLARKS London Derby Shoes in Loden Green Suede - can be worn both in formal or informal settings. Super cool shoes. Clarks Originals iconic Desert Boot construction yet sit just below the ankle with simple, clean lines. A modern twist on the classic Derby, this style is designed in rich loden green suede and teamed with Clarks signature crepe sole. An archive re-launch that is as wearable and relevant as ever. Upper Material: Suede. Lining Material: Leather. Sole Material: Crepe. Fastening Type: Lace. Clarks Mens Sportwear Grey Boots Size 8.5 ,suede brown sheep skin like lining grey lace up ,Dispatched with Royal Mail 2nd Class. With design cues from the their classic Desert Trek, these boots in a soft grey suede feature a Trek man emblem on the heel. A hand-stitched sachetto construction aids comfort and flexibility, while the signature crepe sole adds that finishing touch. Clarks Men Triken Easy Tan Suede Slip On Sneakers Uk Size 10G Look extremely smart by wearing this pair of tan slip-on sneakers from Clarks with your casual outfit. 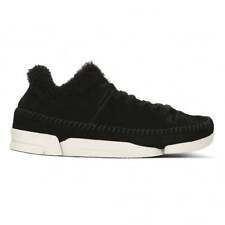 It has a stylish suede leather upper which adds to the overall look and ensures durability. The sole is made of EVA that provides a nice grip and negates the chance of accidental falls. Team it with a pair of chinos and a shirt to look your best. clarks originals wallabee, sand suede, men’s size 10. Condition is New with box. Dispatched with Royal Mail 2nd Class.